The construction of a permanent Sports Hall of Fame building was made possible by its major benefactor, Tom Kearns, in whose honor it has been named. 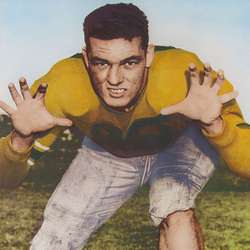 Mr. Kearns, a UM Hall of Famer in football and boxing (1937-1942) and former professional football player, bestowed his generous gift because of his strong desire to preserve the memory of his fellow athletes who laid the foundation for the present and future of UM athletics. "To let all that tradition go down the drain would be a terrible thing," said Mr. Kearns. "In another 30 years, all those artifacts would have been gone. If we didn't build a Hall of Fame, those people might long be forgotten." Mr. Kearns' business and civic affiliations were extensive. He served as a State Representative in the Florida legislature in the mid 1960's and was a direcor of Barnett Bank. He was a past president of the Hollywood (Fl.) Jaycees and the United Fund and was a director of the Hollywood Rotary, as well as the Florida Chamber of Commerce. He was a member of the University of Miami Board of Trustees and a member of Iron Arrow, the University's highest honor. In October, 2010, he was honored as a Miami Sports Founder by the Greater Miami Chamber of Commerce.